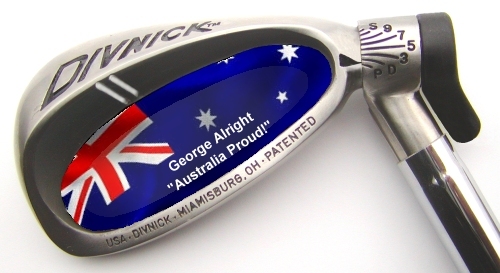 around the world who are using this unique golf club. It's a putter, driver, a full set of irons, and 8 wedges. You can even lock it on HALF LOFTS! Click the picture to see a close-up of the club and lofts. It makes a great travel golf club. 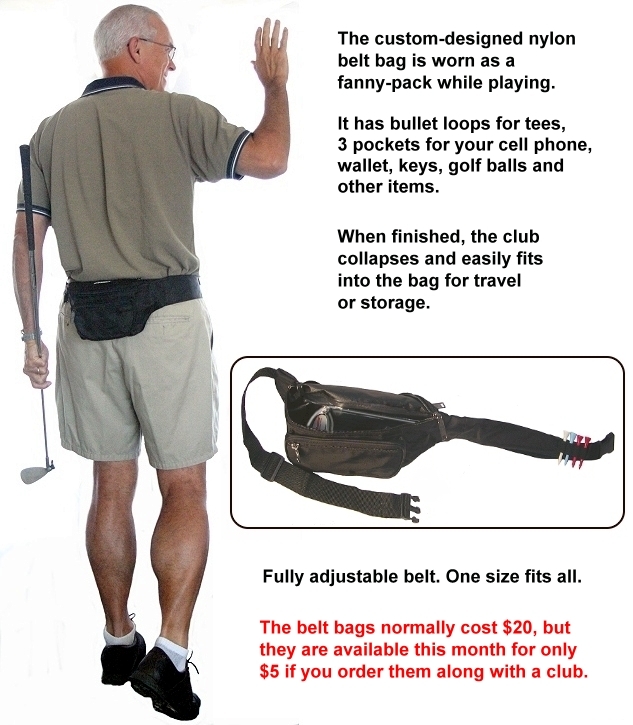 It now costs $25 to $75 per flight to check your full-size golf bag. But you can put your Whole-In-One Adjustable inside your checked bag AT NO ADDITIONAL COST! Our clubs fly free! Click here to read more about baggage fees and TSA Rules. Even if you don't travel very much, many people enjoy it on their local courses without having to lug a full set of clubs around. Some customers keep it in their car for that quick unscheduled round, or to get a few swings in between appointments. 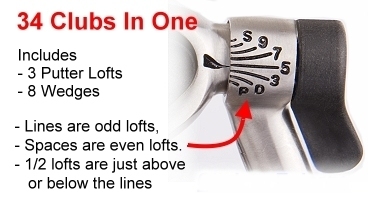 Simple, durable, solid: To adjust the loft, you simply unscrew the lever one turn, shift the transmission so the arrow points to the desired loft, and tighten the lever. Click here to see a close-up picture of the club and lofts. The short video above describes a simplified version of ratcheting the head to set the loft. A more detailed video is on our operating instructions page, along with demonstrations of extending, collapsing, realigning the black lever, and much more. Click here to see detailed operating instructions and videos. 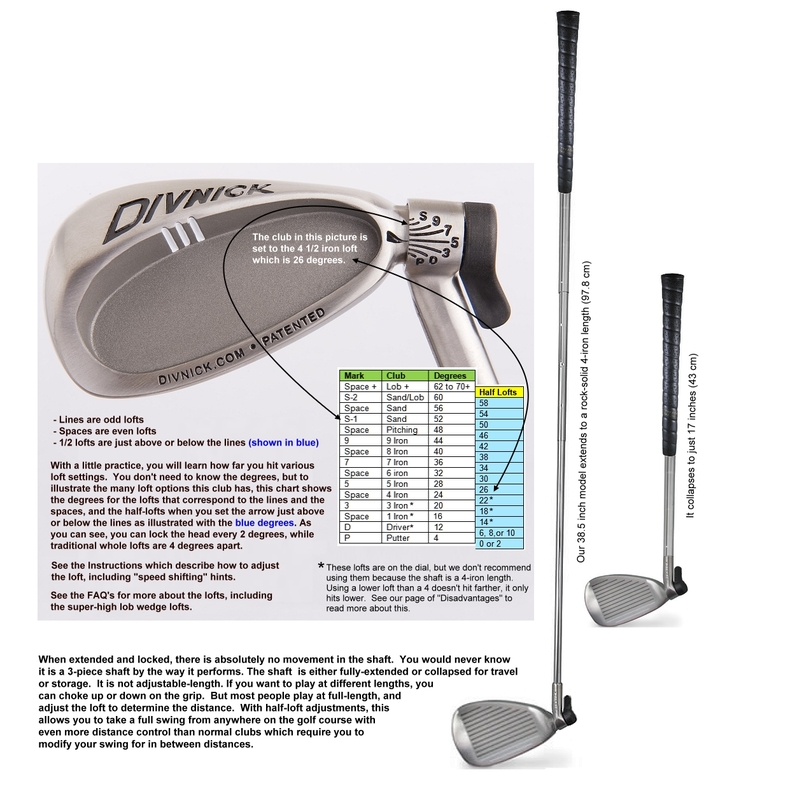 According to independent laboratory robot tests, the DIVNICK telescopic adjustable golf club hits farther and is an unprecedented 21% more accurate than standard clubs! We didn't expect that. Golf Magazine: "Solid . . . 3 1/2 out of 4 stars!" Click here to see more reports and testimonies. For orders received in April we will include the $20 custom nylon golf bag that has three zippered compartments which hold several balls, your wallet and keys, and all the other stuff you like to carry! 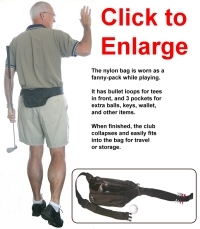 The bag is worn as a fanny pack while playing, and when play is over, the telescopic Whole-In-One Adjustable Club is collapsed and fits completely into the bag for storage. It has an adjustable-length strap so one size fits all. The standard club is shown here in the first picture. You can add your name under a beautiful polyurethane dome which we refer to as a "Polydome". 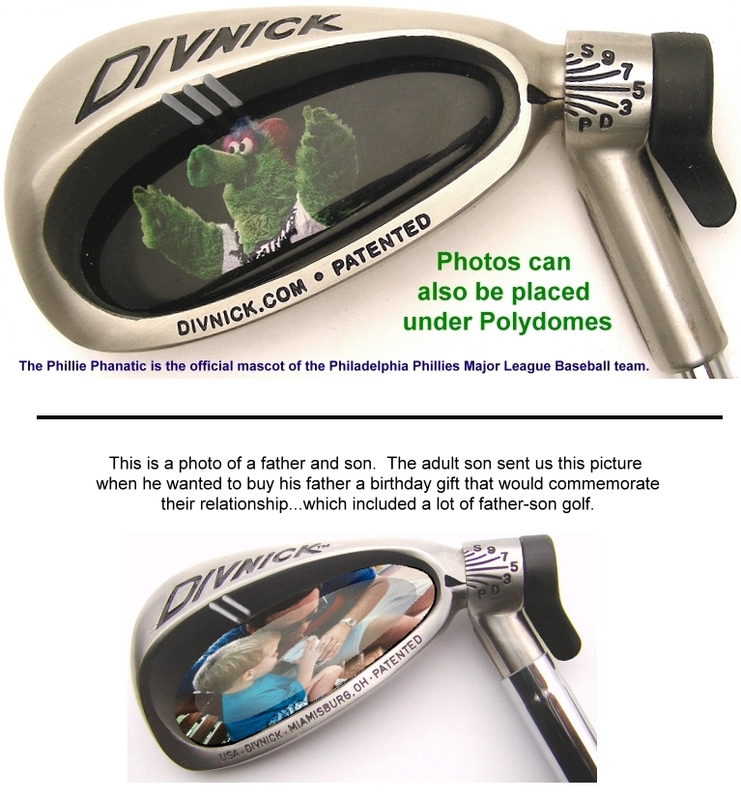 If you are getting it for someone else, it becomes a personalized gift for your favorite golfer—husband, wife, parent, customer, or boss. Options include initials, a name, a company name, a phrase, or all of the above...whatever you want. Obviously, the more print, the smaller it has to be to fit into the available space (about 1 inch by 2 inches. Click here or on the picture to see an enlarged view of this photo. This option is only $10 when ordered with the club ($20 separately). This is a simple "type-setting" option. Logo and photo options are described below. We can also make custom personalization with your choice of font, color and backgrounds such as your country's flag or your college or a photo as illustrated above and in the pictures below. If we can pull an image off the internet or you can send us a .jpg, we can waive the set-up fees (normally $100) and do this for the same as our corporate logo Polydomes described below...just $25. Let us know if you want something special for Polydome personalization and we will answer all your questions before you make a final decision and place your order. 1) It is a visual alignment aid to help you make sure your club is square to the target at address which makes it easier to be square on contact. 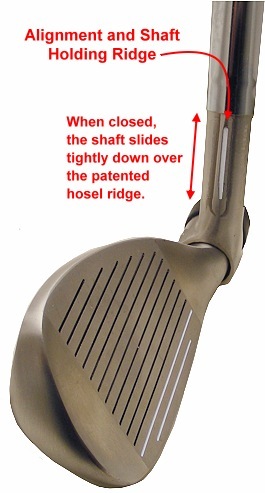 2) The raised ridge frictionally engages and holds the shaft when in the closed position. This is a nice feature that makes it easy to carry the closed club and keep it from unintentionally extending. 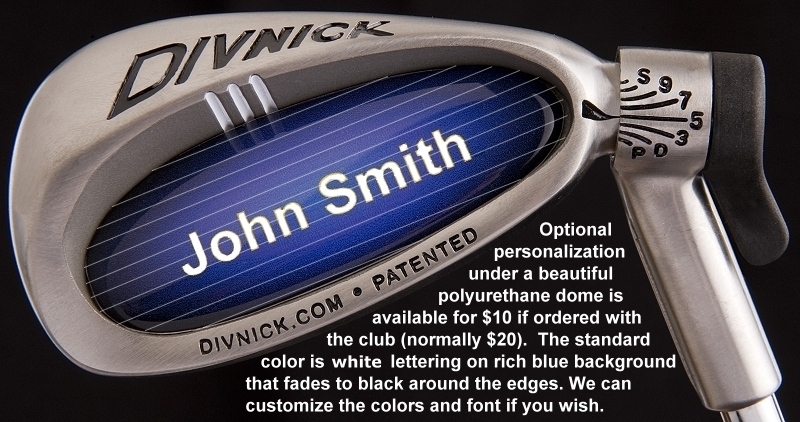 If you want your college logo on your club, we can easily get it off the school's website. We can include your name too. This custom option is available for $25. Click here to read more about custom logos. One of the most popular options is to add a Polydome with your corporate logo. We can include personal names too! Click here to see more corporate logos. Corporate Logo options are $25 and we can usually waive set up fees if we don't have to manipulate your logo very much. Special April	Discount: Through the end of April , you can get a Whole-In-One Adjustable Club for $199 which is $50 off the normal $249 price. Plus, we will include the $20 custom bag FREE! And if you purchase 2 or more, you can get them for $179 each, a $70 discount, and an ADDITIONAL 10% when you order 3 or more clubs! 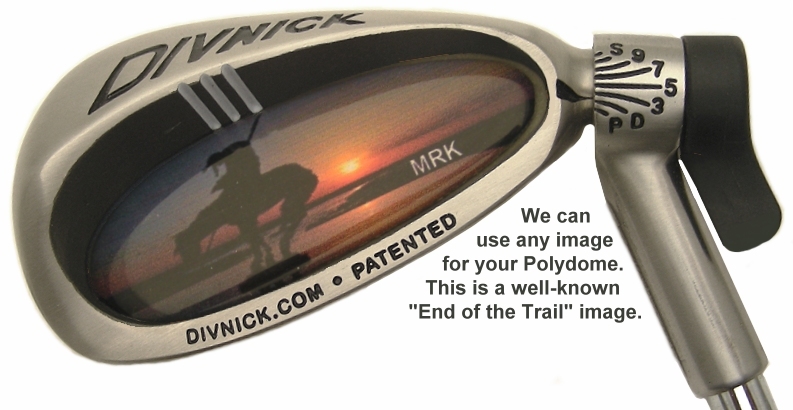 While the "Whole-In-One Divnick Adjustable Club" can play the whole game, it is most like an iron. As a 4-iron length, it can't generate as much club-head speed as a driver. And it is the most unlike a putter in terms of length, shape, weight, and feel. 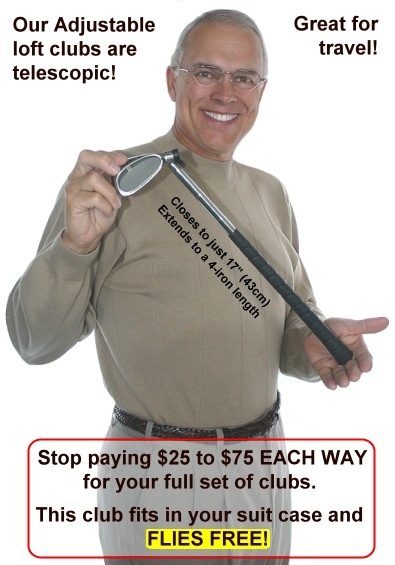 So many customers also purchase a "Tee & Fairway" Driver, and a Telescopic-Putter to go with their Adjustable. You can bomb it off the tee and hit long fairway shots with the TF Driver, replicate all your irons and wedges with the Adjustable, and putt with a normal length and feel with a Telescopic Putter...and they all fit into a checked roller bag so you don't have to pay all that money to the airlines to check a full golf bag! Remember, "Our Clubs Fly Free!" Click here to read more about our Telescopic Drivers, Putters, Hybrids, and Wedges. 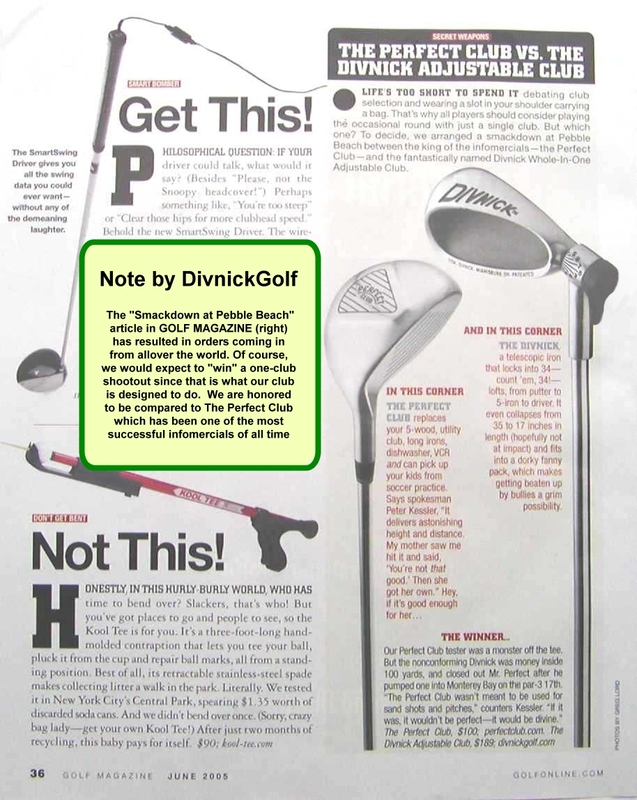 Golf Magazine reviewed our Adjustable club when it first went on the market back in the early 1990's when they gave it a 3.5 out of 4 star rating. A few years later, they compared it to "The Perfect Club" in what they called a "Smackdown at Pebble Beach." It is a cleverly-written and entertaining article. As you would expect, the Whole-In-One was "...money inside of 100 yards," and "...closed out the competition!" Click here to read that article. The Whole-In-One Adjustable is very popular with military all over the world. 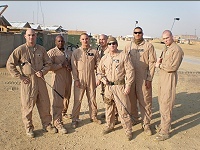 We have special military options, and you can order one for someone in the military if you wish. Click here to read more about our Sponsor-a-Soldier options and see some of the service logo Polydomes. 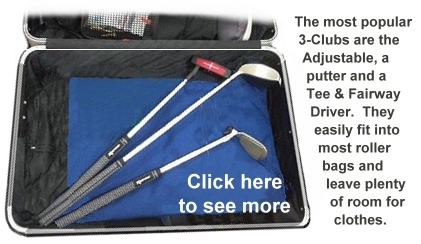 Special April	Discount: Through the end of April, you can get a Whole-In-One Adjustable Club for $199 which is $50 off the normal $249 price, and we will include the $20 custom bag FREE. And if you purchase 2 or more, you can get them for $179 each, a $70 discount, and an ADDITIONAL 10% when you order 3 or more clubs!